Enhance the look and feel of your prayer space with a glowing stained glass masterpiece. If you are building a prayer room in your church or home, consider the beauty of stunning stained glass windows. These church-like windows can help your prayer room gain a more traditional look and feel as they display a glowing masterpiece of Christian art. Graceful curves and rich colors combine with inspiring, sacred images to create a calm and reverent atmosphere, ideal for personal worship and mediation. If your prayer room lacks existing windows, consider utilizing Stained Glass Inc.'s backlit windows. Refined and improved through years of testing, these internally lit designs feature stained glass panels that don't rely on natural sunlight. These "windowless windows" will provide you with the same look and feel as traditional stained glass, without the need of natural sunlight. Additionally, the breathtaking colors and patterns will captivate onlookers for many years to come. 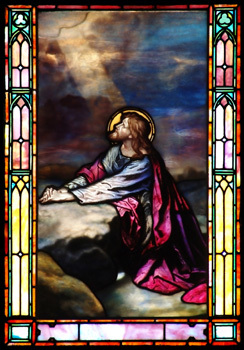 Browse our wide selection of religious stained glass window inserts, or customize your very own. Our windows can be designed to match any size, shape, or color imaginable. To place an order, or find out more information, call or email Stained Glass Inc. today.